Experience a river cruise rich in culture and history along the Seine river in France. The AmaLyra sails between Paris and Normandy, bringing passengers to France's most famous landmarks in comfort and style. The AmaLyra is an elegant river boat offering culturally-rich tours of some of the most historical places in France. Winding along the Seine river between Paris and Normandy, the ship calls at the site of the famous D-Day landings, the house of Claude Monet, and of course, the City of Light itself. This is a cruise which is rich in culture and history, and AmaWaterways' expert tour guides will make sure you are able to make the most of it. Launched in 2009, the AmaLyra offers a classic river cruise experience. With destination-intensive itineraries, she provides an authentic travel experience for adventurous passengers who like to explore culture and history. The ship's small size allows for an intimate, personalized cruise experience, and many passengers become friends during the voyage. An extremely knowledgeable crew keeps everything running smoothly, from mealtimes to shore excursions, and passengers often rave about the excellent level of service. Cruise guests looking for destination-focused river cruising in an intimate environment with a friendly and competent staff would do well to choose AmaLyra. Furnished in decadent warm tones, the staterooms on the AmaLyra provide a relaxing sanctuary to unwind after the day's events. 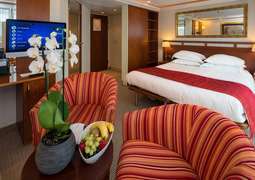 Every stateroom has a river view, and more than 80 percent of rooms have a French balcony. 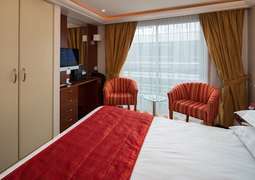 Each stateroom comes with a spacious wardrobe, complimentary high-speed Wi-Fi, a small sitting area including a desk and chairs, and a flatscreen TV that can also be used as a computer. Suite passengers can enjoy a spacious sitting area, a full king-sized bed, and a bathtub in the bathroom. Solo cruisers also have the option of booking a single room to avoid paying full price for a double. AmaWaterways is the only cruise line to belong to Chaine des Rotisseurs, an elite French culinary association, and it shows. Meals are a uniquely gourmet affair, and many dishes are inspired by the cruise destinations. On the AmaLyra, passengers can expect delicious seafood dishes, exquisite French delicacies, and free-flowing beer and wine. Each meal comes with at least one soup offering, and the soups are often prepared according to original recipes with gourmet ingredients. And of course, every meal includes a selection of decadent French cheese from the cheese cart. AmaWaterways offers destination-intensive river cruising, with a high emphasis on the destinations visited during the long calls at port. Shore excursions are included in the cost of the cruise, and passengers can also rent bicycles at no extra charge to explore the areas visited on their own. Evening lectures prepare passengers every night for the next port they are visiting, so passengers can make the most of their time on shore. To liven up your time on board, check out the whirlpool on the topmost Sun Deck, treat yourself to a massage in the spa, or head down to the Piano Deck for some light evening entertainment. Daytime wear on the AmaLyra is casual, with most passengers opting for active wear and comfortable shoes for the shore excursions. Dinners are usually resort casual or smart casual, and there is generally no need to dress up. The one exception is the Captain's Dinner, which takes place once per cruise, in which more formal dress is encouraged.